February, 2017PAS128 – Why the confusion? There’s been a lot of buzz in the survey industry lately about PAS128. After a slow start, more and more companies are using PAS128 as their specification of choice when procuring utility surveys. However, as with any new way of working, there is still some confusion and misconceptions surrounding the PAS128 document. Some of this confusion arises from the language used – PAS128 is a technical specification aimed at the survey practitioner, so it does have its fair share of jargon that can be difficult to get to grips with on first reading. Other elements that can seem confusing are the different codings used for the various survey types and the different methodologies involved and when to use them. Sam Roberts, one of our directors here at Met Consultancy Group was a consultee on the specification, prior to publication, and is already leading our survey and utility mapping team in the provision of PAS128 surveys. Met have trained our utility surveyors in PAS128 and all now have the QCF qualification in Utility Mapping to either Level 3 (Utilities mapping surveyor) or Level 5 (Senior Utility mapping surveyor). It’s our intention to have all of our surveyors qualified to at least a Level 4 standard (Utility Mapping Supervisor) by the end of 2017. In the first of our PAS128 blogs we de-bunk the confusion around what exactly it is, and why we believe it’s a huge step forward for the survey industry. 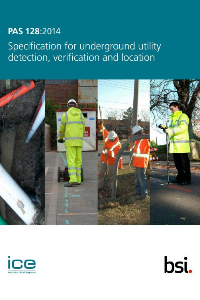 Published in 2014 by the British Standards Institution and sponsored by the Institution of Civil Engineers, PAS128 provides a specification for underground utility detection, establishing a standardised approach for the detection, verification and location of buried assets. PAS128 applies to utilities buried no deeper than 3 metres, in urban and rural areas, and on public or private sites. The specification defines four survey categories, relating to different Quality Levels (A, B, C or D). Starting at D, and becoming more detailed and accurate as you progress up the levels, each category of survey adheres to escalating compliance requirements. Each category of survey gives a varying level of confidence in the utility mapping, depending on the detail and accuracy of the final data obtained. Prior to PAS128, the most widely adopted utility mapping guidance was The Survey Association scheme, which was based on levels of survey numbered from 1 – 6, and this change has led to some confusion in the marketplace. The switch to a letter coded scheme has been inspired by other specifications in use around the world such as ASCE 38-02 in America and AS 5488 in Australia. Why do we need PAS128? 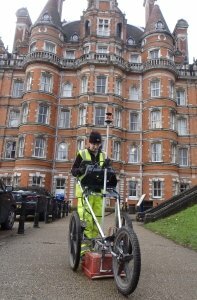 Met surveyors conducting a GPR survey at Royal Holloway, University of London. In excess of four million holes are dug in UK roads every year to repair utility assets, install connecting services or lay new cables and pipes. Location records for older buried assets are often inaccurate or even non-existent leading to service disruptions, third party damage or injury, project delays and increased costs and, ultimately, reduced market confidence in final data integrity and the delivery of utility mapping services. How do you get a PAS128 survey? Whichever survey level you decide on, make sure you choose qualified, experienced surveyors. The survey team should meet or call you to discuss your project aims and produce a plan and method statement before undertaking the survey. Once the survey is complete your results will be delivered in a standard report format, and further discussions should take place to make sure all your project aims have been met, or decide if further investigative work needs to be undertaken. With varying degrees of confidence in the final data, it’s sometimes tempting to request the highest level of survey in all situations; but this isn’t always necessary. Clients can save time and money by speaking to someone about the right survey type for the project and outputs required. If you’re unsure about which type of survey you need, one of our experienced team will be happy to help, call us on 0113 200 8900 or complete the contact form on our website. Comments Off on PAS128 – Why the confusion?